Discussion in 'DIY (Do-It-Yourself) Discussions' started by jcolon, May 12, 2013. I got fed up in buying 50$ shure cables with mic for me SE215. I really like the stock cables, but i need a mic for what I do. So I was wondering what connects to where on the plug. I tried to find out myself on one of the cables but it seems thet they encased the cable in a hard plastic on top of the soft one. So if anyone could help me, I would really appreciate it. 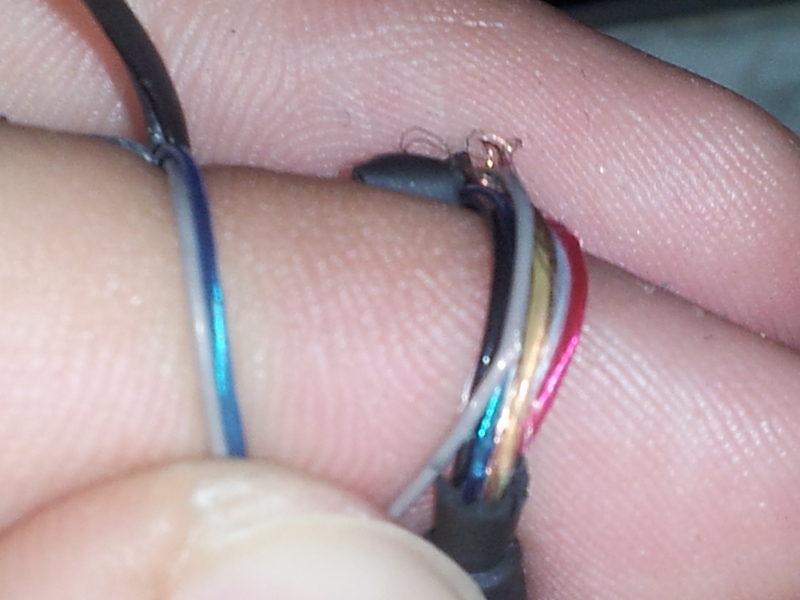 So I have a red wire, black, blue, grey and of course a copper one. It truely is a hassle to spend 50$+tx on ****ty cables that break by just looking at them. So can you just point me in what direction to go? Also for my future cable adventures, do you have any opinions in what type of cabling I should choose? What mic would work? I only need one of those 1 button mics for an android phone (galaxy s2X). 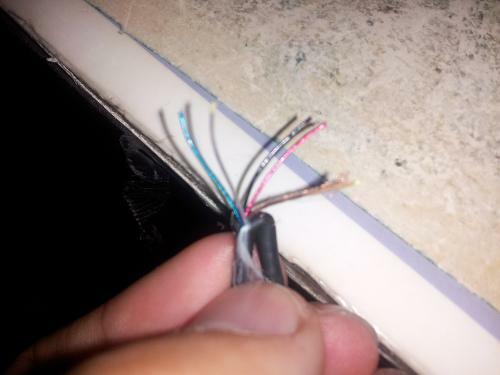 The right cable has red, black, blue, copper and grey. Could you guys help me and tell me on what points to solder on? And this is my connector. I'm a bit confused, is that just a long wire or is it already attached to something? I guess I'm not entirely clear on what you want to do. I should of been more specific about the long grey wire. I pulled it out by accident. But I am happy to use one of the dead cables I have for educational purposes. But I've only soldered trs audio cables. Do you think you could tell me what number goes with what color? Having the blue and grey wires on both sides bother me to no end. Thats about all I know. If I were to get a multimeter (My current burnt a fuse), how and what should I check? Use continuity mode between what you suspect should be connected and see if you get 0 ohms or a similarly small resistance. Sleeve is : Mic - Yellow insulated wire.